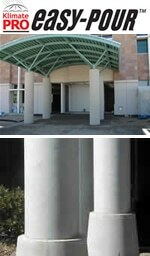 Caraustar is a leading producer of fiber tubes used to form concrete columns, footings, piers and other structures. Caraustar KlimatePRO™easy-POUR™ forms are engineered to provide outstanding performance under tough jobsite conditions and even in inclement weather. Produced using 100% Recycled Paperboard, our multiple manufacturing facilities located across the United States and Canada put us close to where you need us most.